There's so much going on in this video. I love it! 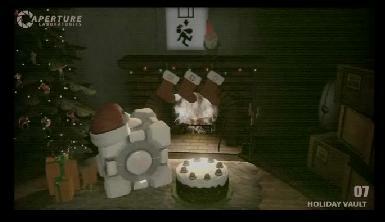 ApertureScience.com, the site for a small Alternate Reality Game (ARG) back when Portal was about to launch in the Orange Box collection from Valve, has updated at some point (I don’t know when, as this could be really old…) but there’s a video with a holiday theme. It’s so worth spending the 30 seconds to check it out! And because I love Jonathan Coulton and GLaDOS so much, here’s a typographic video for the song “Still Alive”… Enjoy!